Posted by admin in Chile, NASA Earth Observatory. 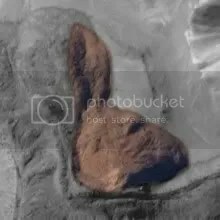 At the NASA Earth Observatory there’s a spectacular astronaut photograph taken on 22 August 2010 of part of the volcanic landscape of the central Andes, on the border between Chile and Argentina. Among the volcanoes visible are Cerro el Cóndor, Peinado and Nevado Ojos del Salado, the world’s highest active volcano with a summit 6,887 metres a.s.l. This is a highly active volcanic region and the image reveals a fascinating and complex landscape of volcanic creation and erosive destruction, which is expertly discussed in the accompanying NASA caption. Posted by admin in activity reports, Chile, eruptions, Planchón-Peteroa. Planchón-Peteroa: aerial view towards the east, showing the arrangement of the craters, the currently active south-western crater and deposits of ash on the icecap and snow. SERNAGEOMIN image, taken on 7 September 2010. On the basis of the overflight of the area of the Planchón-Peteroa volcanic complex carried out on 7 September by SERNAGEOMIN personnel it can be concluded that Planchón volcano is maintaining eruptive activity with weak explosions, possibly of phreatomagmatic origin, similar to minor phases of the eruption recorded in 1991. The currently active crater is the south-western, which has for several years usually shown persistent fumarolic activity. The current eruptive activity shows local accumulations of ash in the area within 10 km of the volcano and no alterations have been observed in the glaciers of the volcanic complex. The activity is described as consisting of ‘discrete pulses of gases and fine ash with a frequency of between 40 and 60 seconds’. These emissions create a ‘weak eruptive column of grey colour’ rising up to 200 metres above the crater, which then disperses towards Argentine territory, to the east of the volcano. The current activity at Planchón-Peteroa, according to SERNAGEOMIN, does not present a hazard to the local population, but continuous monitoring of the volcano will be carried out for as long as the activity continues. Planchón-Peteroa is currently at ‘alert level 4 Yellow’. Planchón-Peteroa: aerial view towards the south-east, showing the western flank of the Planchón (north)-Peteroa (south) volcanic complex, with prominent ash deposits on the icecap and snow. SERNAGEOMIN image, taken on 7 September 2010. Planchón-Peteroa: aerial view towards the east, showing the low altitude of the eruption column and the plume dispersing towards the east-south-east, over Argentine territory. SERNAGEOMIN image, taken on 7 September 2010. Planchón-Peteroa volcano is in central Chile, on the Chile-Argentina border. The complex history of this stratovolcano has produced the present-day nested group of three volcanoes: Azufre, Planchón and Peteroa. All historical eruptive activity has originated from Peteroa – there have been several explosive eruptions of VEI=1 and VEI=2 since the 1870s. Recent fumarolic activity in 2006, 2008 and 2010 underlines that this is very much a restless active volcano. Currently and from a technical point of view, the volcano is changing to moderately explosive eruptive activity, with a phreatic-vulcanian component (solid material) in the acid lakes of the crater zone. Occasionally during 6 September an eruption column of pyroclasts and gases was observed, black in colour, which reached up to 1,200 metres above the crater zone, with a dispersal plume reaching at least 30 kilometres in length, mostly towards the east and, in a small percentage, to the north and south. 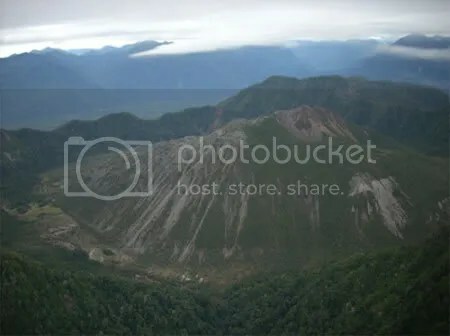 The bulletin notes that a ‘rock-fracturing’ earthquake of magnitude 5.2 at a depth of 13.4 kilometres was recorded on 6 September some 9 kilometres south-east of the volcanic complex. SERNAGEOMIN will be installing a seismological network and working with other Chilean agencies to maintain a full programme of monitoring at Planchón-Peteroa. There have been suggestions that the current activity may have been sparked by the February 2010 Chilean earthquake (Erik has more on this at Eruptions), which is not the first time an earthquake has been put forward as a possible cause of eruptive activity at Planchón-Peteroa: Watt, Pyle and Mather (2009) suggest (in their Table 2) that an eruption of this volcano in July 1960 may have been triggered by the earthquake of May 1960. Watt et al argue that the incidence of volcanic eruptions in the aftermath of large earthquakes is signficant enough to justify the conclusion ‘that seismic eruption triggering following large earthquakes, with delays of several months, is a significant process in volcanic arcs’ without it being possible to pin down individual eruptions as being the result of particular earthquakes, and certainly it is not possible to say that the 2010 earthquake is responsible for the current activity at Planchón-Peteroa, any more than the same could be said for 1960. There is just not enough evidence to make a solid connection, and anyone who jumps right in with a declaration that big earthquakes = more volcanic eruptions is going way too far, but it’s an important and very interesting line of research; given the complex tectonic context of Planchón-Peteroa there is clearly much more work to be done before a clear conclusion can be reached. Posted by admin in Chaitén, Chile, eruptions, volcanoes. View of Chaitén caldera and lava dome before the May 2008 eruption (© Eric Manríquez). The eruption of Chaitén volcano in southern Chile began two years ago today, on 2 May 2008. Since that date eruptive activity at the volcano has continued uninterrupted: the intensity has varied, but the activity has never ceased. View from May 2009 of the Chaitén dome complex (courtesy Mr Javier Romero, Vialidad MOP, Puerto Montt). During the coming week, to mark the second anniversary of Chaitén’s awakening, there’ll be a series of posts here at the Volcanism Blog looking at various aspects – volcanological, social, economic and environmental – of this remarkable and endlessly fascinating eruption. Sequence of images of the Chaitén lava dome during March 2010 (SERNAGEOMIN). UPDATE. Family problems of a serious nature mean I’ve been unable to provide the Chaitén coverage promised in this post – please accept my sincere apologies. I will catch up with Chaitén, and with much else, when I am able to do so. Posted by admin in Chaitén, Chile, volcano monitoring, volcanoes. 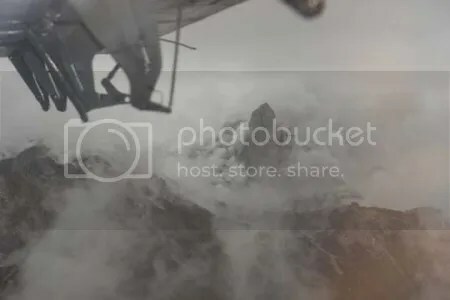 For the last two years we have been watching the Chaitén volcanic eruption through the cameras operated by the Chilean civil aviation authority, the Dirección General de Aeronáutica Civil de Chile (DGAC), at Chaitén airfield. The DGAC deserves congratulations for keeping those cameras working night and day, through the sometimes very difficult conditions thrown up by the weather and the volcano. Posted by admin in Argentina, Chile, Llullaillaco, NASA Earth Observatory, volcanoes. 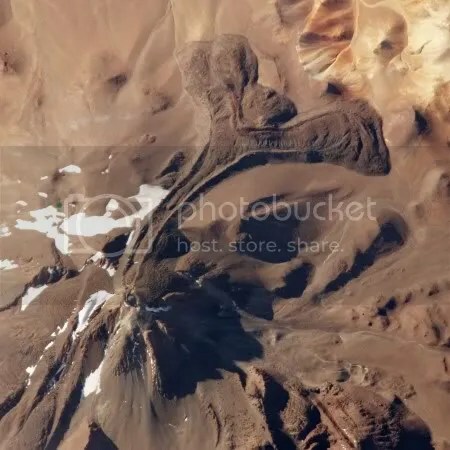 The latest image of the day at the NASA Earth Observatory is this astronaut photograph of Llullaillaco volcano, which is situated on the Argentina/Chile border. Llullaillaco is the highest historically active volcano in the world, 6739 metres high, and last erupted in the nineteenth century. The lava flow extending to the north of the volcano shows very clearly features typical of a viscous flow on a steep slope. Lava at the edges of the flow has cooled more rapidly than that in the centre to produce the walled channel effect of a flow levée, while the faster cooling of the upper surface of the lobe at the front of the flow has produced characteristic layering and pressure ridges at 90 degrees to the direction of the flow. The Earth Observatory caption refers to the lobes of this flow as coulées (but this is what I call a coulée). Is another Chilean volcano awakening? Melimoyu volcano in the Aysén region of southern Chile, a glaciated stratovolcano with a summit elevation of 2400 m and a distinctive horned profile, has been making some seismic noise over the past few days. Chile’s state geological service SERNAGEOMIN reported on 20 March that three earthquakes, two of magnitude 3.3 and one of magnitude 5.0, were detected on 17 March beneath Melimoyu. The earthquakes, which have been felt by people in towns near the volcano, continued at a lower level on 18 March. The earthquakes were detected by the University of Chile’s seismological network and by the network set up to monitor the eruption of Chaitén volcano, which is 140 km north of Melimoyu. The foci were located beneath Melimoyu, at depths of between 3 and 22 km. As of the publication of the SERNAGEOMIN bulletin on 20 March the seismic activity was continuing with magnitudes between 2.0 and 3.0 and frequencies of up to 2 earthquakes per hour; during the activity of 18 March the frequency had reached 8 earthquakes per hour. However, no visual anomalies have been detected at Melimoyu. SERNAGEOMIN has responded to this activity with commendable speed by installing a network of six seismic stations at Melimoyu to enable permanent monitoring of the volcano. Pilar Cuevas Mardones, Intendenta of Aysén region, is quoted in El Diario de Aysén as saying that the seismic activity at Melimoyu ‘may indicate the possible beginning of activity at the volcano, which has been dormant for many years’.